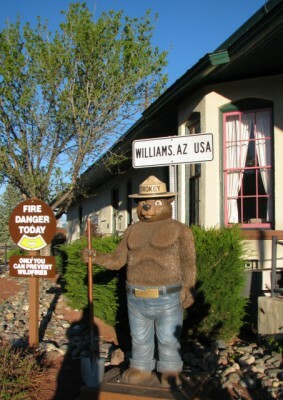 After our visit to the Grand Canyon, we spent another night in Williams, Arizona. We got up early the next morning, because we had a long drive ahead of us. The day had come to make our way back to California for Jon’s cousin’s wedding. Marina del Ray, to be exact. Jon was concerned that if we didn’t get an early start, we would end up in Los Angeles during rush hour traffic. And if you have read this blog for long, you know that Jon and traffic don’t mix well. I hadn’t had a chance to see much of Williams though, except for a quick drive by the night before. So I convinced Jon that I would get out of the hotel a little earlier than he wanted, if we could drive downtown and I could have 20 minutes to wander around and take photos. We struck a deal. If we were out of the hotel by 6:30, I could have the 20 minutes while Jon filled the car with gas and drove by the coffee stand to get us a little perk-up. 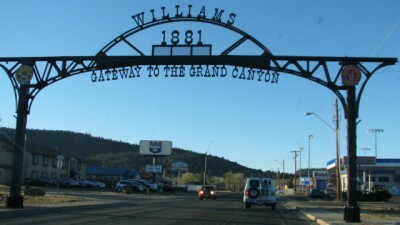 Williams was founded in 1881, and currently has a population of about 3,000 residents. 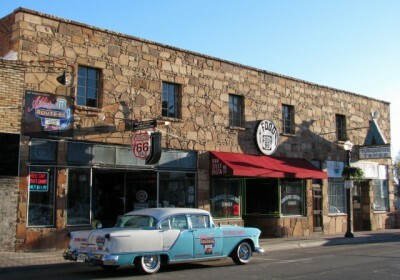 Williams was located on Route 66, and contains the last section of Route 66 to be bypassed by Interstate 40, in 1984. Of course, I-40 passes right outside of town, so it didn’t have a huge impact on the economy. Williams, Arizona and Route 66 – I love the Turquoise Tepee! 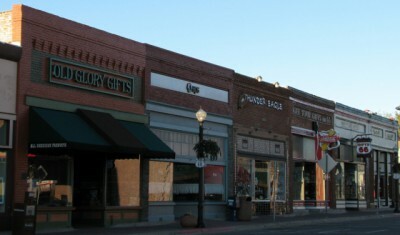 The historic downtown core is 6 blocks long, and has several souvenir shops, restaurants, a wine tasting room and a historic hotel. There are lots of Route 66 signs, and several historic neon signs from days gone by. It is wonderfully maintained, and was a treat to spend a few moments wandering around with my camera in the still of the early morning. I would love to go back and spend more time there. 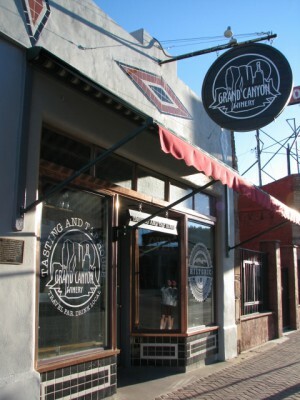 The Grand Canyon Winery – I would have liked to check it out! Jon came back to get me after his errands, and we headed west on our way back to California. The drive was long (more than 6 hours), but most of it was very easy, with very light traffic. It was bittersweet as well, because we knew that although we were heading towards family and a fun occasion, it also meant the end of a fantastic, whirlwind tour of some really amazing parks. I did finally get to see some pronghorn though! There were a couple walking in a field near the road. The picture isn’t fantastic at all – it is hard to take pictures of wildlife when you are driving by at 70+ miles per hour! 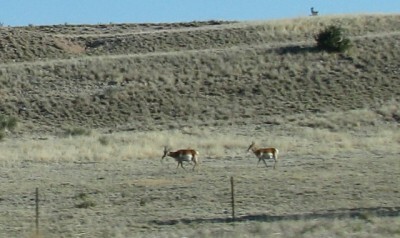 But I think you can tell that they are pronghorn. Pronghorn! You can tell they are pronghorn, right? The only hiccup was when our GPS unit finally pooped out and would navigate no more. As we were heading into Los Angeles, we knew we would need some directions. My Dad was kind enough to map our route and read it to me over the phone as we cruised through the Mojave Desert. After hours of driving, and some traffic backups at the end, we finally pulled into the ritzy Marriott in Marina del Rey. Valet parking only… I don’t know what they thought of us… We hadn’t showered, we were wearing hats and dusty hiking shoes, driving a subcompact car with dust everywhere and clumps of red clay mud clinging to the mudflaps and the undercarriage. A memorable moment for sure! Our vacation was winding down – but not before spending time with lots of family! 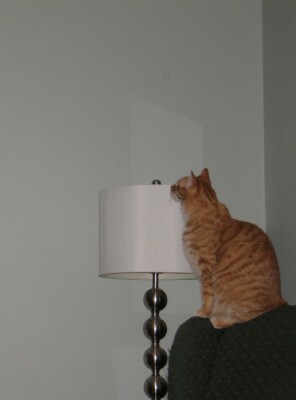 Oliver has developed two new fascinations lately. He LOVES the new diet cat food that Coraline is eating. Yep, she’s chubby, he’s not, but he goes Cuckoo for diet food Cocoa Puffs! No day at the Grand Canyon would be complete without some hiking into the Canyon. When Jon and I (mostly me!) were originally planning our Southwest tour, we were both really interested in hiking to the bottom of the Canyon. Although it is possible to make the hike in one day, most people recommend hiking to the bottom, staying overnight at the Phantom Ranch, either staying in the hostel or camping, and then making the hike out of the Canyon the next morning. Unfortunately, as we were only going to be at the Grand Canyon for one full day, we ultimately decided that we wouldn’t be able to do the full hike on this trip. Earlier in the day, while we were exploring the Grand Canyon Village, we hiked a short way down the Bright Angel Trail. 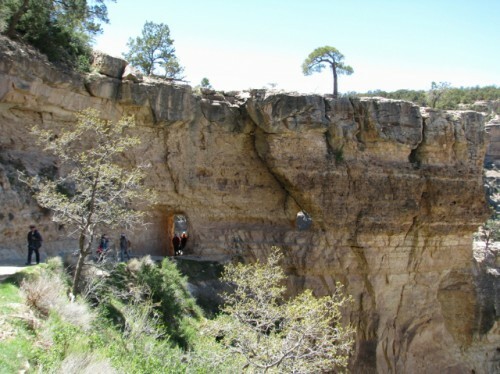 The Bright Angel Trail head is right next to the Kolb Brothers Studio; it is the longer of the two routes to the Phantom Ranch, with a total length of 9.9 miles from the trail head to the Ranch. It is also the more popular trail most for day hikers descending only a short way into the Canyon and also for hikers doing the entire route to the bottom. 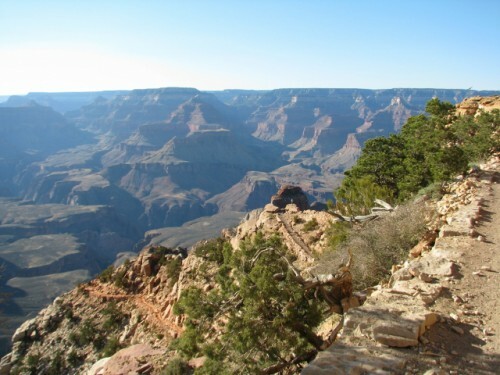 It is not as steep, and it is situated right at the Grand Canyon Village. On our hike of the Bright Angel Trail, we discovered that the trail is very popular. There were dozens, if not over a hundred people hiking on the early portion of the trail, ranging from serious hikers with poles, lots of water and sun protection, to tourists in flip flops charging down the trail with no water and only a cell phone camera. We even saw a dog, although the trail is clearly marked with a sign indicating dogs aren’t allowed. But as I have said before, people are stupid. There are beautiful views, and lots of places to stop along the trail for photos. We only hiked about 1/3 mile down, because we hadn’t had lunch yet and hadn’t filled our water bottles. After we finished checking out the Desert View Watchtower, we parked along the highway and walked over to the trail head for the South Kaibab Trail. This trail also descends all the way to the bottom of the Canyon and meets up at the Phantom Ranch. 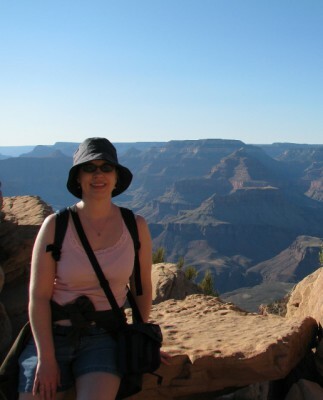 It is significantly shorter than the Bright Angel Trail, reaching the Phantom Ranch in 7.4 miles. However, it is also much steeper, with grades as steep as 22% in some places. And unlike the Bright Angel Trail, the South Kaibab Trail does not provide access to water at any point along the trail, only at the trail head and the bottom of the Canyon. 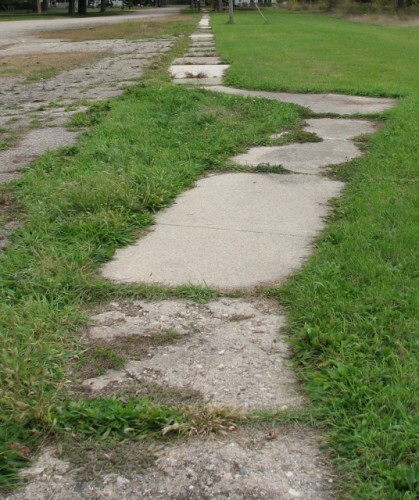 Plus, the trail head is much more remote, which cuts down on the scores of tourists. 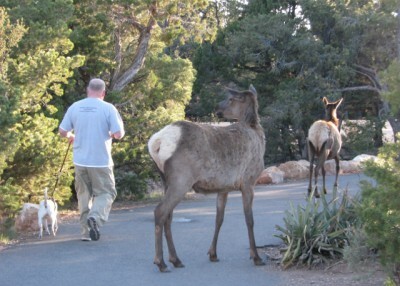 As we walked over to the South Kaibab Trail Head along the Rim Trail, we started seeing our first live elk. They were literally standing on the trail about 10 feet away from us! Which left us in a predicament, because the rangers say you are to back away from the elk, but we needed to go that direction! And the elk didn’t seem to be the least concerned about our presence. After a few minutes, they moved off the trail and we were able to scoot around them, but not before taking some photos. And we definitely weren’t at the recommended 75 feet of distance! 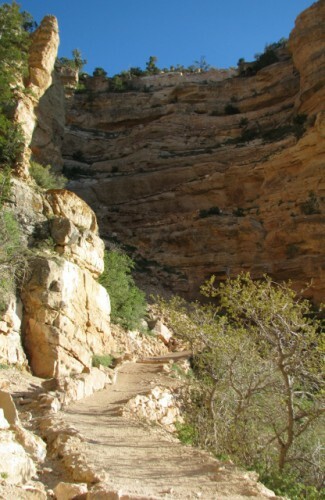 The South Kaibab Trail begins with several switchbacks that take you quickly below the rim; I think there are 9. It reminded me of Walter’s Wiggles at Zion National Park, on the Angels Landing Trail. And you are greeted with amazing views! We hiked 0.9 miles down into the Canyon, to Ooh Aah Point, and I was struck by the view the entire time. At Ooh Aah Point, we stopped and rested for a little while, before beginning the hike back up to the Canyon Rim. So, what did I think? Well, it was strenuous, with sections of the trail that were fairly steep. I’m certainly not a super athlete though, so people that are reasonably fit should manage just fine. I’m pretty convinced that although I probably could do the entire Rim to River to Rim hike in one day, I’m not sure I would want to. I think that would make for a very tired and sore Camille the next day. The South Kaibab hike did test my fear of heights in some sections, because the trail is cut right into the edge of the cliff, and there is no railing or berm to keep you from going over the edge if you were to lose your footing. Seems like another reason not to try the entire hike in one day, because fatigue could certainly cause some missteps. There were some areas where the scree beneath our feet was pretty loose, and made our feet slip a little bit before finding our footing again. But all that said, I enjoyed the hike, and in fact it was one of my favorite hikes during the trip. I think we only passed about a half dozen hikers on our entire two mile hike! It was very peaceful. Back at the top of the Canyon again, we walked the half mile back to the car, seeing that the elk had multiplied since we last went through. As it was getting close to sunset, it made sense that they were out looking for their evening meal. We still tried to give them their space, but it was difficult as they were literally all around us! Fortunately, they showed no aggression towards us at all, and we were able to get back to the car without a mishap. This guy wasn’t bothered by the elk – too close for my comfort! Our very full day at the Grand Canyon was coming to a close. We got into the car, and after navigating the car through dozens of elk walking in and near the road, we headed back to Williams. Our time in the car was spent recapping the day and all the amazing experiences that we had. Jon had originally not been that excited about the Grand Canyon, because of the high numbers of visitors, but it ended up being one of his favorite places. Amazing geology, historic buildings, stunning views, California Condors, crazy squirrels, stupid humans, elk, and the hike of a lifetime. We packed a lot into one day, and I can’t wait until we have the opportunity to return! What was your favorite part of the Grand Canyon? What do you still want to see and do there? It is no mystery that I love owls. I have blogged about my fascination before. 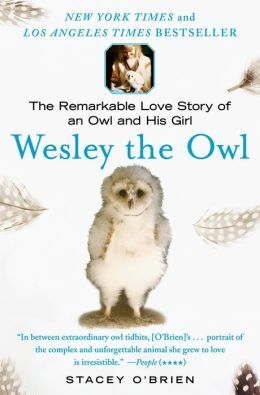 So, when I came across Wesley the Owl: The Remarkable Love Story of an Owl and His Girl by Stacey O’Brien, in the bookstore, I knew I had to read it! O’Brien tells the story of how she worked as a young adult for Caltech, caring for raptors in their research program. As a biology graduate, she was learning a lot and loving her work. Then one day, she was given the opportunity to adopt a baby barn owl with an injured wing that could never be released into the wild. She knew that if she chose to accept him, she would be making a commitment for his entire life. Owls will bond with one person, and will be committed to that person forever. She didn’t know at the time that it would be a journey that would last 19 years. Along the way, she learned a ton about barn owls and their habits, and provided information on Wesley to the other researchers. She grew up with him, documenting his journey from a fluffy fuzzball baby, through his clumsy adolescent phase, and his remarkably long adult life, especially given barn owls in the wild live on average about four years. O’Brien also developed a bond with Wesley that had never been documented before between an owl and a human; she became his “mate.” Her descriptions of how Wesley tried to woo her, building nests under the toilet and calling her to them, and his extreme jealously when she interacted with men is surprising and hilarious. O’Brien’s book is very informative, providing a wealth of information about owls and their behavior in the wild, as well as how they react in captivity. She candidly and honestly relates that joys that came from raising a wild animal, as well as the struggles that came from sacrificing human relationships in order to put Wesley first. Her writing style is descriptive and detailed; you can imagine his movements, his antics and his calls while reading her words. It is a book that will be appreciated not just by those who like owls, but by all animal lovers. Like any true love story, their relationship comes to the inevitable, sad, end, but not without imparting the reader with a sense of how much she truly loved this remarkable bird. Have you read Wesley the Owl: The Remarkable Love Story of an Owl and His Girl? What did you think? We had already seen a ton in our first couple of hours at the Grand Canyon. We saw the view from Mather Point, hiked a couple of miles of the Rim Trail, looked around the Grand Canyon Village, and hiked about a quarter of a mile down into the Canyon on the Bright Angel Trail. But now, it was time to see something different. I wanted to check out the Desert View Watchtower. From the Grand Canyon Village, we took the shuttle bus back to the main Visitor’s Center where our car was parked, and we drove 26 miles to the east in the park, to where the Desert View Watchtower is located. 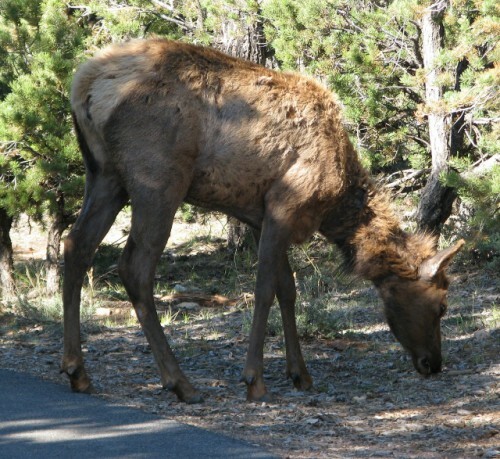 Along the drive, you are met with views of the Pinyon Pine forest, along with signs announcing that this is elk country. And there is even a sign announcing that there are cougars crossing the road! Sadly, we didn’t see any cougars, and the only elk we saw was a dead one by the side of the road. Please people! Slow down – what’s your hurry!? In short order, we got to the Desert View Watchtower, went to the Visitor’s Center for this section of the park to get my stamp and made our way over to the tower. 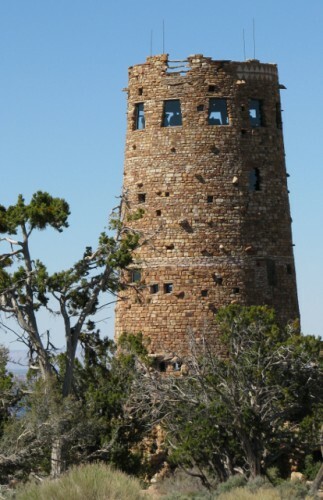 The Watchtower was another of the Grand Canyon’s historic structures that was designed by Mary Colter and built in 1932. Colter spent six months researching Puebloan ruins to try to emulate the style. It is believed that the ruins at Hovenweep National Monument were a major influence of the final design. 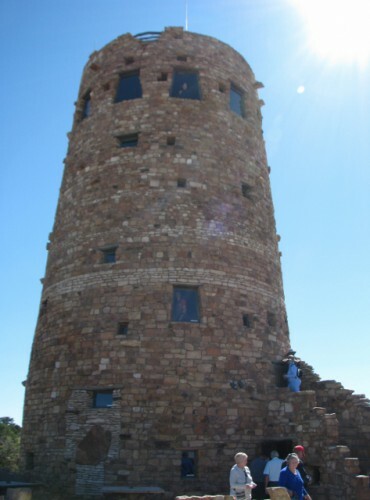 Although the Watchtower is much taller, at 70 feet, than any Puebloan architecture, she created a structure that contains some similar stylistic elements. The Desert View Watchtower is four stories, with a gift shop on the first floor and a series of narrow stairways leading to successive floors. There are windows of various sizes throughout the tower, giving visitors impressive views of the canyon. 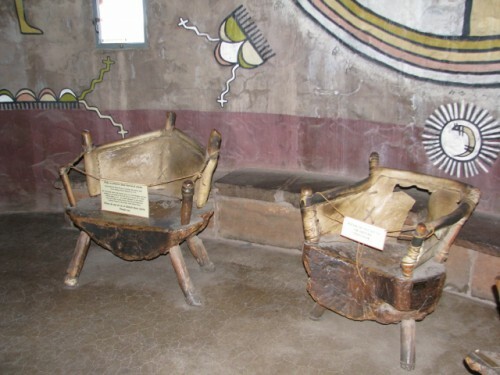 There are also murals painted on the walls inside by Fred Kabotie, a Hopi artist who also served as the caretaker for the Desert View Watchtower for a period of time. The furniture inside the tower is original to the structure, and has held up well over time, given the millions of tourists who have visited. When viewing the Watchtower from the outside, you notice that Colter did not do any shaping of the stones used to build the tower. She believed that marks from the mason’s tools would detract from the visual appeal of the structure, so stones were chosen and placed without any shaping. It gives the tower a very natural look. You can also tell that she created and filled in T-shaped doorways, to replicate the structures at Mesa Verde National Park and Chaco Culture National Historical Park. The detail of the historic Watchtower was intended to make it look more authentic. Notice the blocked over T-shaped doorway in the lower left. 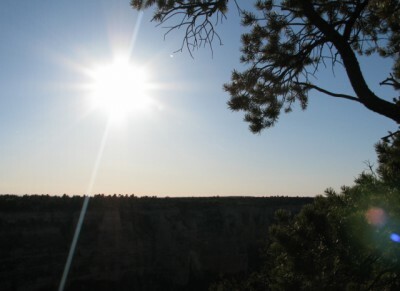 There is a patio in front of the Watchtower that gives visitors panoramic views of the Canyon. 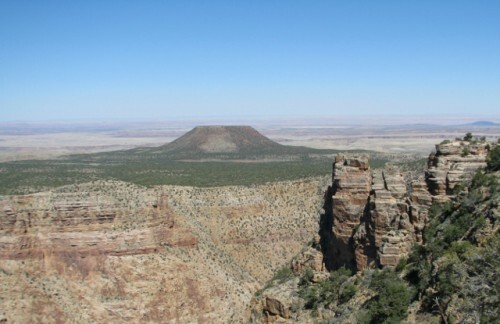 The Grand Canyon Village, Cape Royal on the North Rim, and a cinder cone to the east are all visible from the Desert View Watchtower’s patio. We enjoyed just looking at the view for awhile. But we couldn’t linger too long, because we were going hiking next! No blog post on the Grand Canyon Village would be complete without a nod to the wildlife that also make their home here. 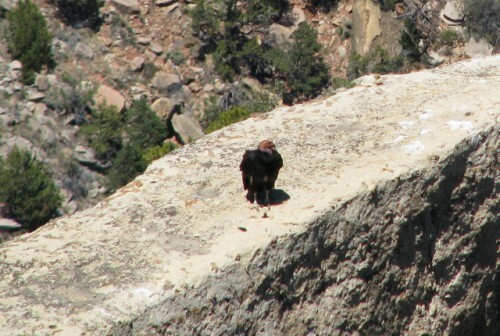 In the village, we saw one of the most rare Grand Canyon residents; the California Condor. I have blogged about the California Condor before, after our visit last year to the World Center for Birds of Prey, in Boise, Idaho. The center is one of only a few California Condor breeding facilities, where these magnificent birds are hatched and reared for release into the wild. 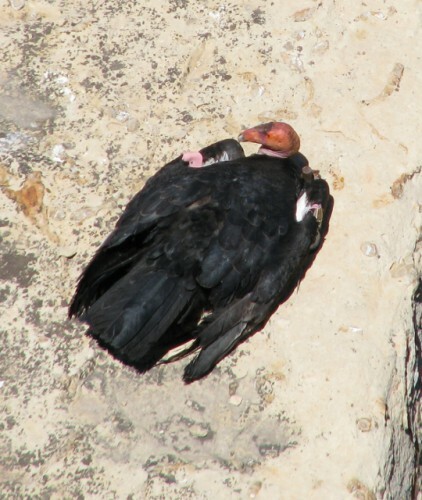 The Grand Canyon is one of the locations where the condors are released, and there are currently 73 California Condors known to be making their home in Northern Arizona and Southern Utah. But knowing that there are a small number of condors in the Grand Canyon is different than actually seeing one, and I didn’t dare to dream that I would be one of the lucky ones! He (or she) was sunning himself on a ledge just below Lookout Studio. Just hanging out, unaware of what the fuss was all about. I feel blessed to have had the opportunity to see him. Jon would say I’m being sappy, but it was a very special moment. Also, in the village, we saw one of the most prolific Canyon residents, and also probably the most diabetic. No, I’m not talking about the people, I’m referring to the Abert’s Squirrel. 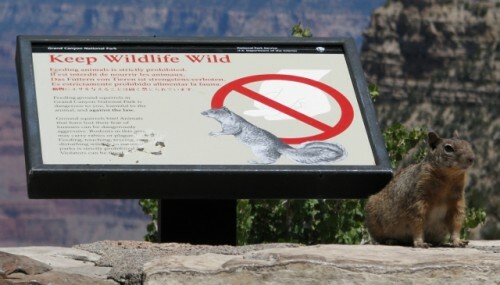 Immediately upon entering the Grand Canyon Village, you see signs warning you to not feed the wildlife. In particular, the squirrels. Why not? Well, because feeding animals makes them dependent on humans and unlikely to survive on their own, which is a prerequisite for being wild… Not to mention that human food isn’t good for digestive systems that haven’t adapted to it. And squirrels carry fleas, which carry the plague – not something I want to mess around with, thank you very much. 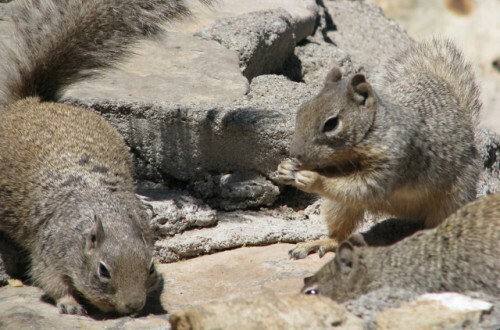 Additionally, habituating squirrels to people means that you are now encouraging super-aggro squirrels, which leads to approximately 250 reported squirrel bites in the Grand Canyon each year. And if all that weren’t enough, by the way, it is illegal under federal law. I think he figures this might be the best place to score some food! But despite all the reasons not to, we only had to wait about 0.2493 seconds before we saw people feeding the squirrels. Right next to the sign that said not to. People are stupid. We stepped into one of the dining establishments, an ice cream shop that also sold sandwiches and brats, to get a quick lunch to enjoy while sitting out in the open air of the village. I got a brat and some Cheetos; Jon got some Greek yogurt and fruit. Within seconds of sitting down, a squirrel ran up and stole my bag of Cheetos! Jon managed to grab them back, and in an instant, the squirrel grabbed one end of the foil bag that my brat came in! I experienced a brief but terrifying Tug’O’War with this pipsqueak of a beast, before emerging victorious when the end of the bag tore and squirrel was left with just a chunk of foil paper. Shaking… we moved to another section further away from the aggro squirrel. We sat down and I repositioned my meal tightly in between me and Jon. 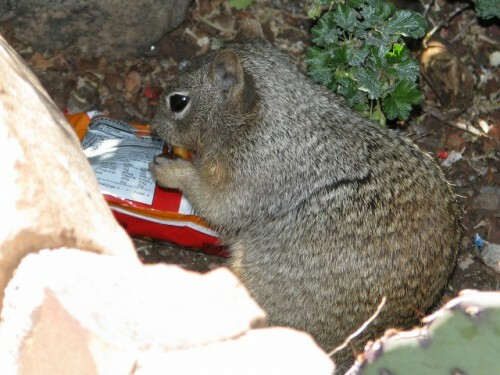 It wasn’t enough… In another instant Cheeto the Squirrel had hold of my Cheetos bag once again – it wasn’t even open yet! I had been defeated. Cheeto the Squirrel tore into that bag and was munching to his heart’s content within a few seconds, complete with bright orange fake powdered cheese coating his paws. I do feel fortunate that I wasn’t bitten, and didn’t have a plague infected flea jump on me in the melee. The other tourists were highly entertained at my misfortune, so I adopted an “if you can beat ’em, join ’em” mentality and took a couple of photos of my victor enjoying his spoils. I was pretty disappointed though, as I hardly ever eat Cheetos and was really looking forward to them. I present to you, Cheeto the Squirrel. This is what happens when other people feed the squirrels – you get crazy, aggro squirrel bandits! And so dear readers, have you ever been a victim of National Park wildlife gone rogue?